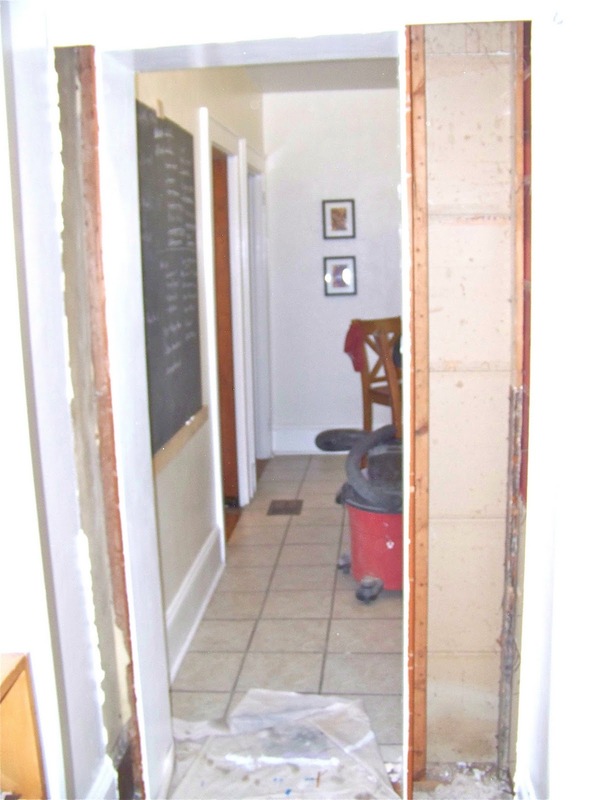 Moving the half bath was the first step in our renovation plans for the back half of the house. Now that it is finished, we can move on to the next steps. 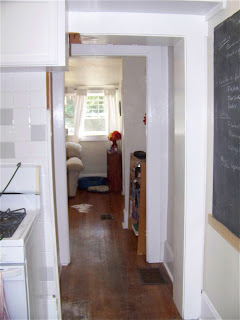 We want to turn the old bathroom into a pantry but right now it is an awkward space behind the fridge. 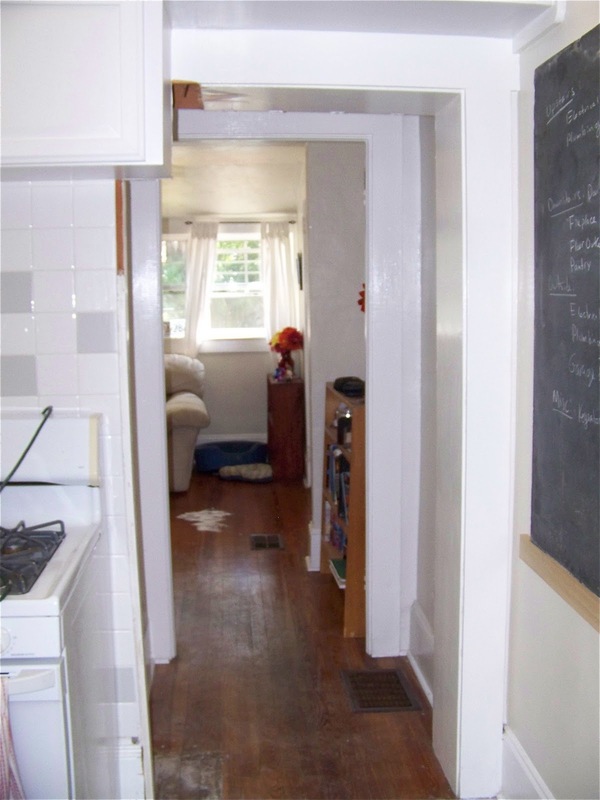 The main reason it is so awkward is because the backside of the fridge is sticking into it so that the majority of the space is a narrow hallway. We played around with a lot of different ideas but in the end decided to do something a little different. 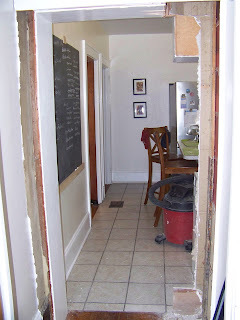 In one of the apartments we lived in back in MA, we had a walk in pantry that we absolutely loved and since we already had the walls up in that corner, we decided to leave them and turn the area into a walk in pantry. We'll show you more about this later, but before we could make any progress in that area, we had to get the fridge out of the way. In most of our plans for renovating the kitchen, we want close up the doorway that leads to the office and our bedroom. 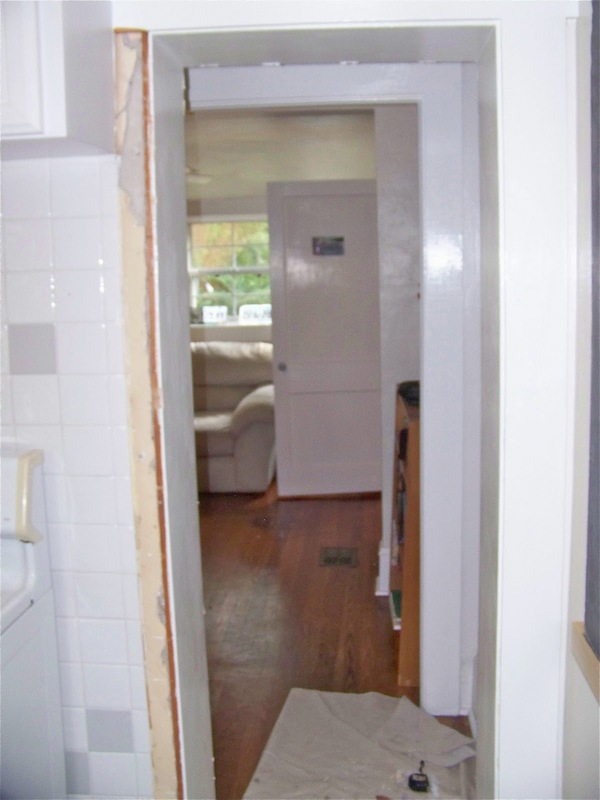 It's an awkward pathway that feels like you are walking through a closet and we think there are better ways of accessing the back area (more on that later). 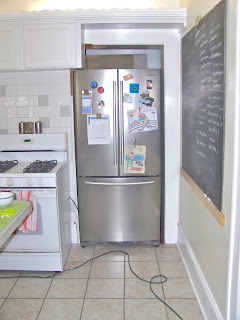 To get use to the idea of not walking through but not closing the wall up just yet, we decided to move the fridge over to that spot. Since we currently have the chalkboard on that wall, we didn't want to block it so we decided to push the refrigerator through as far as we could. In order to do this, we had to widen the door a bit. It probably would have been easier to just move the chalkboard, but this also allowed Nate to figure out why the door frame was so wide and awkward at that point. It turns out there was absolutely no reason why it was like that. 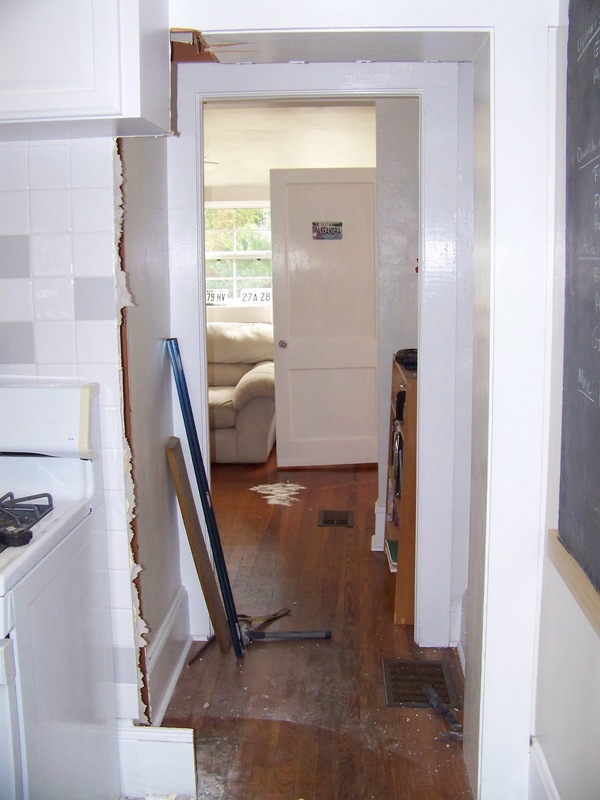 Our best guess is that they framed the wall ou just so the cabinet over the stove would fit. 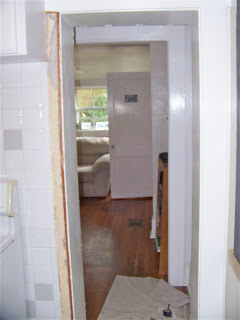 Since we were planning on taking that cabinet out to put a hood in, we had no problem widening that doorway. Nate removed about a row and a half of tile to make the door wider. Here it is all cleaned up. 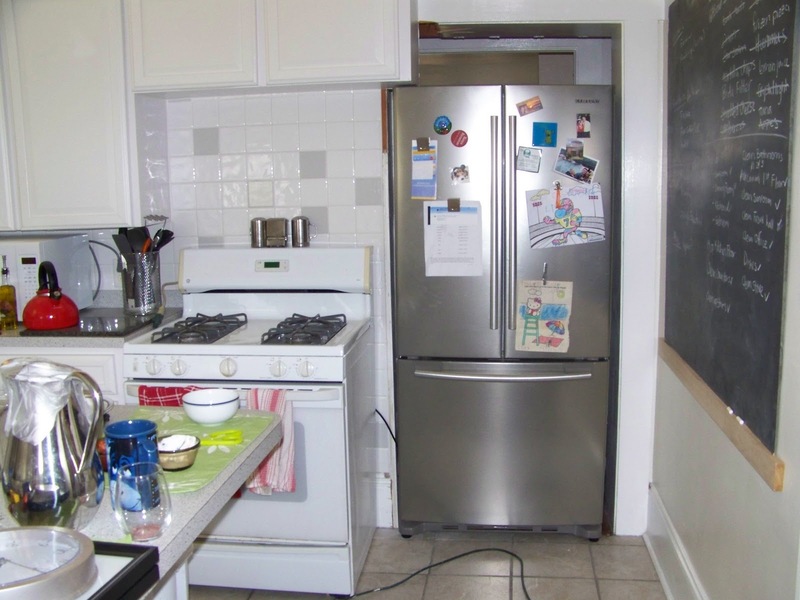 You'll notice that the cabinet hangs over just a little bit but luckily the fridge fits under it and we'll take care of the awkwardness of it later. Once the door was done, we just detached the waterline and unplugged the fridge and rolled it over to it's new spot. We are going to live without the ice maker for awhile until we decide whether this is the final resting spot of the fridge or if we decide to move it again. Love your site and the work you are doing. Been waiting patiently to hear more about Nate's dad's visit and the projects you all worked on while he was there. Hope you have some good photos of him working with Nate.